I believe Venezuelan president, Hugo Chavez sees himself as the heir to Fidel Castro. I believe he will try to use his country's oil wealth, to achieve Castro's dream, socialism from Mexico to Argentina. Here are a few items on Chavez, taken from the Australian Communist Party's "Guardian" and the Communist Party of India (Marxist)'s "People's Democracy". "Venezuelan President Hugo Chavez stated that his country has developed an economic model to live honourably, to fairly distribute wealth among all people and to demonstrate that there is a new spirit of solidarity and co-operation. "There is a new logical alternative to capitalism, which is no other than socialism, and we are building our own socialist model without emulating the ones from the past", Chavez noted. The Venezuelan leader made the remark at an act where property belonging to the National Industrial Valve Assembling Company was expropriated. "This business is born under another option — that of sharing the property between the workers and the state, a different form of social property to the logic of capitalism which lacks a human face", said Hugo Chavez." "Hugo Chávez Rafael Frias, President of the Bolivarian Republic of Venezuela boldly asserted that the 21st century belonged to the working people of the world and it belonged without doubt to socialism before an audience of several thousand people in and outside of the sprawling Rabindra Sarovar stadium in south Kolkata (formerly Calcutta) on March 5. Chávez said that he had already concluded six bilateral treaties with India and that he looked forward to the cooperation between the two countries — as between workers, peasants, fishing-folk, students, youth, and women of India and Venezuela — widening and deepening. "We shall supply oil to India", said the Venezuelan President. Kolkata, said Chávez, "is a city of working class and has an intellectual tradition and it has always stood against colonialism and imperialism: no wonder the British colonialists thought it prudent to shift the capital away from this great city". For 27 years a Left Front Government — led by the Communist Party of India (Marxist) — has been in office in the state of West Bengal and the Venezuelan leader declared amidst cheering that it was his firm belief that the Left Front Government would "continue to serve the people for very many more years to come". 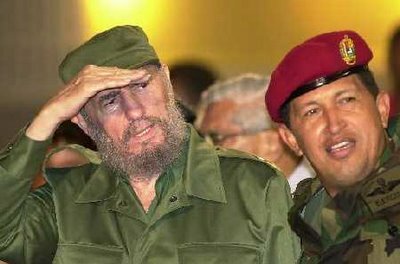 Chávez said that he would take the opportunity to send forth his greetings to "two other Communist governments of the world: China and Cuba", and say saludos to Fidel and Hu Jintao. In Chávez's words: "We have come to your state to learn how to work for the people, by remaining with the people all the way". Chávez said that he was repeatedly struck by the similarity of the ambience, political, social, and environmental, prevailing in Kolkata and Bengal, and that in Venezuela. "I do believe that everything here looks very familiar to me as if I am still in Caracas." Chávez declared amidst cheering that while the 19th century belonged to Europe and the 20th century to the USA, the 21st century belonged to socialism and to the working people of the world. The 21st century will surely witness the people of Asia-Africa-Latin America winning their rights from the grip of the imperialists. "The people of these continents must unite and struggle and imperialism will bow low before us", declared the Venezuelan leader. Quoting Karl Marx, Chávez called upon the working people of the world to unite and said that the time had come to iterate that slogan all over the world as the working people struggle against imperialism. Chávez said Imperialism had ruined the economies of both Latin America and India, and imperialism was also a sworn enemy of democracy. Chávez said that for three years now Venezuela had been engaged in a struggle to ward off US moves against it. He said that although the US was determined to destroy Venezuela, the people of Venezuela are determined to triumph over imperialism. "If the US launched an aggression against Venezuela", declared Chávez, "they shall have to pay the highest price." The history of Venezuela was in the process of being rebuilt through revolution, Chavez asserted, and he said that no one could defeat the Venezuelan revolution. "We want the 21st century to be the century of social justice, of the triumph of the working people everywhere, and of Socialism. Socialism is the future and it is a certainty", declared Chavez before ending his speech by reciting a Tagore poem, which was then recited in the original by Bengal Chief Minister Buddhadeb Bhattacharjee. Earlier, welcoming Chávez, Buddhadeb Bhattacharjee briefly described the anti-imperialist tradition of Kolkata and declared that Chavez, a friend of and a comrade to Fidel Castro, was also the torchbearer of the tradition set by the Latin American hero of anti-colonial struggle, Simon Bolivar. Venezuela has sent oil to Cuba, which has sent 14,000 doctors to Venezuela, a bright example of cooperation in Latin America. The Bolivarian Alternative of America was the way of the future, said the Bengal chief minister. Buddhadeb hoped that Chávez's visit would strengthen the ties between India and Venezuela. He ended his speech by declaring that the people of India and of Bengal would always remain with Chávez." You can't say he hasn't warned us. The "Liberal" Word, Help or Hindrance?